It’s finally here. The moment that everyone has been waiting for since February. The return of fresh wild salmon! The return of fresh wild salmon to our display cabinets is one of my markers for the beginning of summer. The almost gem stone red of sockeye makes me think of hot days and long summer evenings. There are however a few misconceptions about wild salmon that I would like to clear up. First, all wild salmon that is commercially available is from the pacific (so either sockeye, chinook, coho, pink, chum) – there is no wild Atlantic (or Black) salmon commercially available at least in Canada (I’ve heard rumors about Iceland). Second, just because a salmon is wild does not make it “good”, just like a farmed salmon is not automatically “bad” – eating wild salmon can be extremely harmful to the environment if the salmon is caught without the correct gear, in the wrong areas or at the wrong time of year (http://seafood.ocean.org/seafood/search?keywords=salmon for more information). Third, wild salmon is much leaner and typically stronger tasting then farmed salmon (with perhaps the exception of Chinook) – these animals have had to really work to stay alive so they’ve kept off the extra pounds. 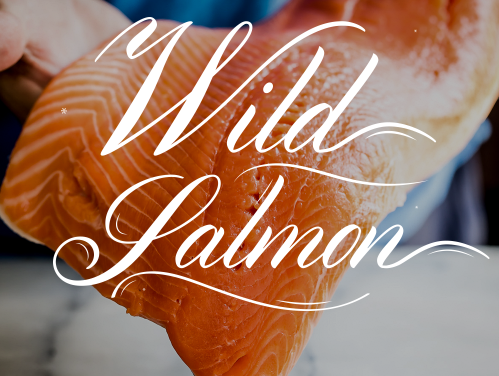 So now that you have your wild salmon, what do you do with it? Well any recipe that works for Atlantic Salmon will work for wild salmon but with one major difference – make sure you cook it less. Remembering that wild salmon is much leaner then farmed salmon I would suggest cooking it to no more then medium doneness (which is about 6 minutes per inch of thickness at 375 Fahrenheit after letting the fish come to room temperature), otherwise you could end up with a very dry, unappetizing meal. With all that said, go “wild” and enjoy this summertime treat!